But the term is really so ‘06. Today’s term, “climate neutral,” complicates the issue. Tracking carbon is great, but carbon dioxide (CO2) is only one of several greenhouse gases that contribute to global warming, says the 2008 publication, Kick the Habit: A U.N. Guide to Climate Neutrality, by the United Nations Environment Program. CO2 makes up some 80 percent of the world’s greenhouse gases, but five others—nitrous oxide, hydrofluorocarbons, perfluorocarbons, sulphur hexafluoride and methane—also contribute. Limits on all six gases were called for by the Kyoto Protocol international climate treaty. Semantics aside, whether a person can live in a climate-neutral manner is a question of lifestyle choices and making improvements over time. Start your climate neutral quest by calculating your energy usage. Type “climate footprint” or “carbon footprint” into Google and try a couple of calculators that track use in different ways. One is Earthlab’s and another one is offered by the University of California at Berkeley. 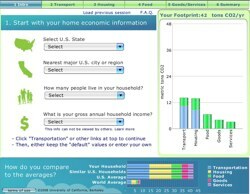 For a calculation, you’ll need information about your home energy use and your travel by car and public transit. Some calculators ask whether you’re vegetarian, how much you recycle and compost, and how much you spend buying goods and dining out. The equation can get involved. Record your information sources, and then revisit the calculator periodically with new numbers to see how you’re doing. The final element involves a carbon offset, “an emission reduction credit from another organization’s project that results in less carbon dioxide or other greenhouse gases in the atmosphere than would otherwise occur,” says the David Suzuki Foundation, which promotes “ways for society to live in balance with the natural world.” You can purchase credits from a renewable energy company, for instance, to offset the amount of carbon emissions you can’t eliminate through other measures. Will your efforts make a difference? Kick the Habit says that, for individuals, “less than 50 percent are direct emissions (such as driving a car or using a heater).” About 20 percent are caused by the creation, use and disposal of products we use; 25 percent comes from powering workplaces; and 10 percent from maintaining public infrastructure. You can drive your car less and turn down the heat, but consider ways you can affect business and government policies that could tap into that other 50-plus percent. Different countries do have differing standards in regard to how much pollution gasoline and diesel automobile engines are allowed to emit, but the reason you see so fewer diesel cars in the U.S. is more of a choice by automakers than the product of a decree by regulators on either side of the Atlantic. Since the advent of the automobile age in the U.S., gasoline has been king of the road; today upwards of 95 percent of passenger cars and light trucks on American roads are gas-powered. And the federal government has done its part to keep it that way, taxing diesel at a rate about 25 percent higher than gasoline. A recent assessment by the American Petroleum Institute, an oil industry trade group, found that federal taxes accounted for 24.4 cents per gallon of diesel but only 18.4 cents per gallon of gasoline. 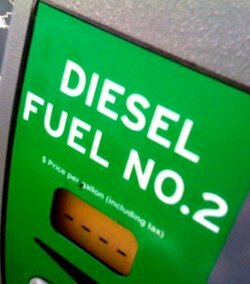 In Europe, where in many regions about half of the cars on the road run on diesel, these tax incentives are flip-flopped, with diesel drivers reaping the economic benefits accordingly. But according to Jonathan Welsh, who writes the “Me and My Car” Q&A column for The Wall Street Journal, interest in diesels—which typically offer better fuel efficiency than gas-powered cars—has gained significant momentum in the U.S. in recent years given the uptick in gasoline prices. The popularity of diesels also surged, albeit briefly, in the mid-1970s after the U.S. suffered its first “oil shock” that sent gas prices through the roof. But gas prices settled down and so did American fervor for diesels at that point. Today, though, with so much emphasis on going green, diesel cars—some of which boast similar fuel efficiency numbers as hybrids—are on the comeback trail in the U.S. Recently passed regulations require diesel fuel sold in the U.S. today to have ultra low emissions, which appeals to those concerned about their carbon footprints and other environmental impacts. 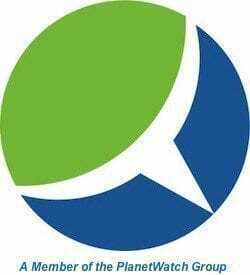 Also, the increased availability of carbon-neutral biodiesel—a form of diesel fuel made from agricultural wastes that can be used in place of regular diesel fuel without any engine modifications—is convincing a whole new generation of American drivers to consider diesel-powered cars. Right now only Volkswagen, Mercedes and Jeep sell diesel-powered cars in the U.S., but Ford, Nissan and others plan to launch American versions of diesel models already successful in Europe within the next year. Meanwhile, the U.S. Coalition for Advanced Diesel Cars, a trade group that represents several automakers as well as parts and fuel suppliers, would like to see the U.S. government increase incentives for American drivers to choose diesel-powered engines by leveling the fuel taxation field—so gasoline and diesel could be competing fairly at the pump—and by boosting tax breaks on the purchase of new, more fuel efficient diesel vehicles. One hurdle is the relative lack of filling stations across the U.S. with diesel pumps, but as such vehicles become more popular, filling stations that don’t already offer them can relatively easily add a diesel pump or two.